It’s happened to all of us: You sit down at a formal place setting and have no idea which fork to use. Many people start at the outside of the plate and work inward, or sneak a glimpse at their host for guidance. But if you’re the one setting the table, well, you’re on your own. 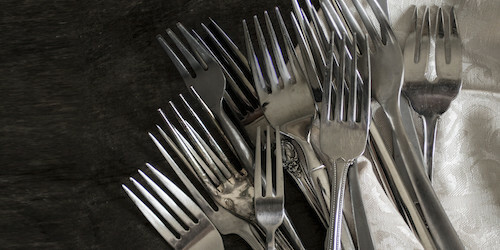 Most five-piece flatware sets come with two all-purpose forks, but those who entertain frequently keep an array of shapes and sizes in their cutlery chests. One rule of thumb: Forks go to the left of the dinner plate in the order of use, with one exception, the oyster fork. From left to right: salad, fish, dinner, dessert and oyster forks. Recognized by its often-reinforced center tines, the four-pronged fork has an extra-wide left tine that can be employed as a cutting edge for vegetables and lettuce. If salad is served after the main course, it will be placed closest to the left side of the plate, to the right of the dinner fork. This fork may be joined by a fish knife, which has a notch that’s used to separate bones. The fork may have three or four tines. The left tine will be slightly larger than the others, with a notch for removing bones. If the fish is tender enough to be flaked, there’s no need for the knife. Usually the longest fork in a set of tableware, this fork has four tines of equal length and is used for the main course. Normally used alongside a knife for meat courses, it’s also known as the place fork. The heavy lifter of the fork world, it has no outstanding features besides being the biggest fork in the drawer. Slightly smaller than the salad fork, it’s also called a pastry fork or pie fork. This fork may have three or four tines, and the left tine will be larger than the others, with a flattened edge. This allows the user to hold a plate in the left hand and cut through pastry with the left edge. The dessert fork may be placed above the dinner plate, or it may be brought to the table when dessert is served. A narrow fork with three tines, this fork (also called a seafood or cocktail fork) is useful for handling shellfish, or for picking up shrimp from a shrimp cocktail. It can remove claw or tail meat from a lobster, although a longer and even narrower lobster pick is often used. This is the only fork that’s placed on the right side of the plate.